Let’s face it, none of us are perfect, and neither is wood. Knowing how to repair defects is critical to the success of any job. Many projects need repair or touch up in some form or another, whether it’s a small knot or check, or when our own short comings in craftsmanship reveal themselves, like on open seam or the mistaken drop of a hammer. Whatever the cause, in this two-point series, I will explain a few simple tricks to repair these blemishes. 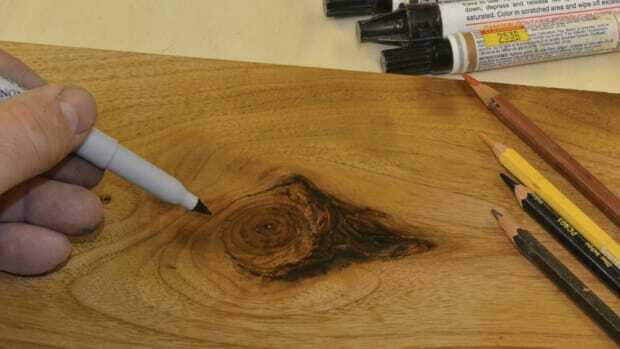 These techniques can be used for raw or finished wood. I break these issues into voids, like an open joint or check crack; and color changes where the wood or repair needs color touchup. In part two, I will cover color repairing and fixing defective finishes. There are a larger variety of types, causes and remedies – too many to cover here – but this information will get you through some major ones. It’s always best to try and fill a void with matching wood, like in an open seam or joint. Filling it with a thin slice of veneer or sliver of wood and gluing it is my first option, but most of the time, defects are irregular in shape or too small for inserting wood. Open knots or checks, large or small, are actually the easiest to fix as they are already a visible and accepted defect. Because these knots are darker than the surrounding wood, filling them with a matching or darker color is typically all that’s needed. Before any repair is done, I seal the wood with a light coat of wax-free shellac that brings out the final color of finished wood, because it aids in color matching. It also helps with adhesion and protects the surrounding area from excessive filler. Always do a color test on a sample board first. When using wood fillers, it’s vital to make sure that the surrounding surface grain doesn’t get filled or clogged with excess filler. This is the most common mistake, and leaves a halo of filler around the repair. To avoid this witness line, tape off the surrounding area before applying the filler. The tape will also act as a raised ledge for solvent-based putties, leaving it slightly high after application and allowing for shrinkage, if there is any. There are many types of fillers that work just fine. They may differ in curing or drying time, expense, odor and available coloring options. Since I like to keep my projects moving and hate to watch the grass grow, automotive putty is my choice for large voids. 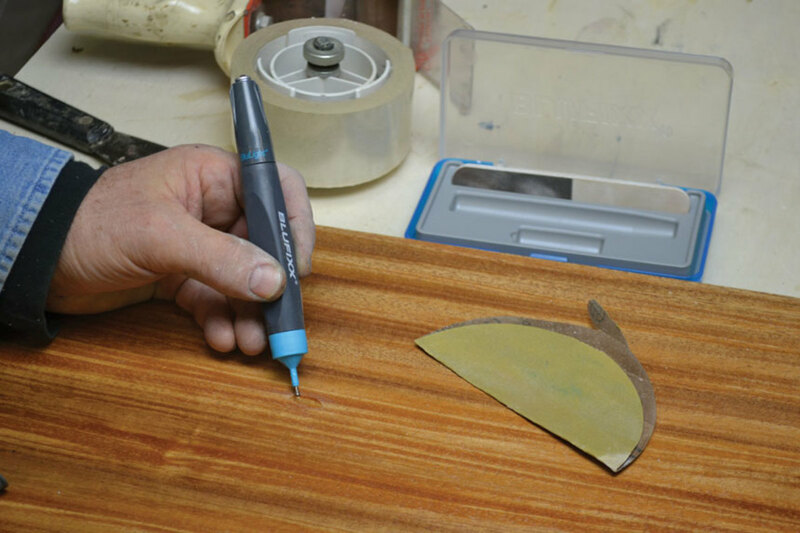 Fill small holes with a solvent-based putty, taping around the defect for a neater job. Bondo, for example, is polyester-based putty filler catalyzed with a two percent hardener of benzoyl peroxide. The hardener has a toothpaste-like consistency and comes in three colors: red, white and blue. I avoid blue because it adversely effects pigmenting or over-coloring. Red is okay when my woods are brownish in color, but white gives me the most pigmenting flexibility. Minwax makes a polyester-based filler with a tan coloring. A downside to polyester fillers is the odor. It has a stinky smell due to the styrene solvent in it, and I don’t recommend using it inside a house or basement. To get a two percent mixing proportion, use a golf-ball sized blob of Bondo to a 1” line of hardener. Once thoroughly mixed, it will set up in 5-10 minutes at 70 degrees F, and is then ready for sanding and finish. Polyester pigments or Blenall powders can be added and mixed in to adjust the color of the putty to closely match your wood. You can also use epoxy to fill holes but the set time is much longer, typically one to 12 hours. I don’t recommend using five-minute epoxies as I have found them too soft and gummy when trying to sand. Urethane is a great quick-setting option but not always readily available. Automotive filler, epoxy and urethane don’t shrink. Most other filler options have solvents, such as acetone, alcohol or water, which cause shrinkage as they evaporate. To combat shrinkage, apply the filler proud of the surface or use two coats. Scratching in grain texture helps guard against a repair that looks too slick and smooth, which is another common mistake, especially with large voids. For smaller voids like thin cracks and pinhole knots, wax is great way to go. Wax comes in a variety of colors and a few hardnesses. For very small voids no larger than 1/16”, I like to use rub-in blending sticks. In a pinch, crayons will work. Simply rub it in or use a heat gun to melt the wax and drip it into the void. After it hardens in a few seconds, remove the surrounding smear by rubbing the wax flush with a hard block of wood wrapped in a cotton rag and a few drops of mineral spirits. There are harder low-heat wax sticks that are better for slightly larger voids, 1/8” to 1/4” in diameter. These waxes are hard enough to prevent a fingernail from pushing in and require a heat gun, iron or open flame to melt in place. Once they set, use an old credit card as a scraper to flush it down, then buff with spirits and a cloth. All of these wax crayons come in a variety of colors and it is typically better to err on the darker side. These specialty waxes will even take a sprayed finish without fish eyeing. 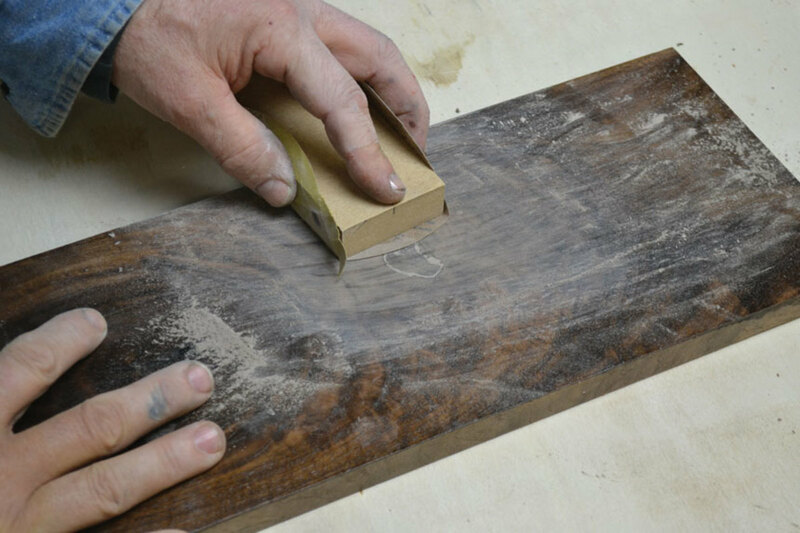 Solvent-based putties like Famowood or DAP wood dough are good for small holes and great for edges and corners where wax won’t have the structural integrity needed. These come in a variety of colors and can be intermixed to adjust the color and dry quickly. For better adhesion, add a small drop of white glue to the mixture, which will also work with water-based fillers. For very fine seams, you can create a simple home mixture of fine sawdust and shellac or PVA glue. As an alternative, instead of trying to hide a defect, you might consider accenting the natural blemish with a contrasting inlay using colored wax, pigmented resin, and mineral or metal dust. Filling a void with crushed turquois and mother of pearl or copper dust is easy to do. Simply fill the small void with the dry powder and adhere with CA glue. Once set, it can be sanded flush and finished. For larger voids, add epoxy to the mix. If the void is really deep, fill with resin until left with a small void, then apply the accent powder. Typically a second coat of fine powder is required to fill any remaining pinhole air bubbles. The last type of void that needs filling is a dent. In these areas, the color and grain of the wood is intact and filling with pigmented filler will cause more of an obvious blemish. First, I try steaming the divot with a few drops of water and an iron. Often this will swell the wood, and once sanded back flush, the color and texture matches perfectly. If the dent still remains, fill with any clear resin, which allows the surface to be flush and the color to show through from below. I like to use a UV or blue light-catalyzed resin like BluFixx, which is a pen that has a squeeze dispenser on one end and a blue light on the other. BluFixx comes in a variety of colors. I like clear and black for knots. Lightly sand the void with 220 grit, and then add a few drops of resin to the void. 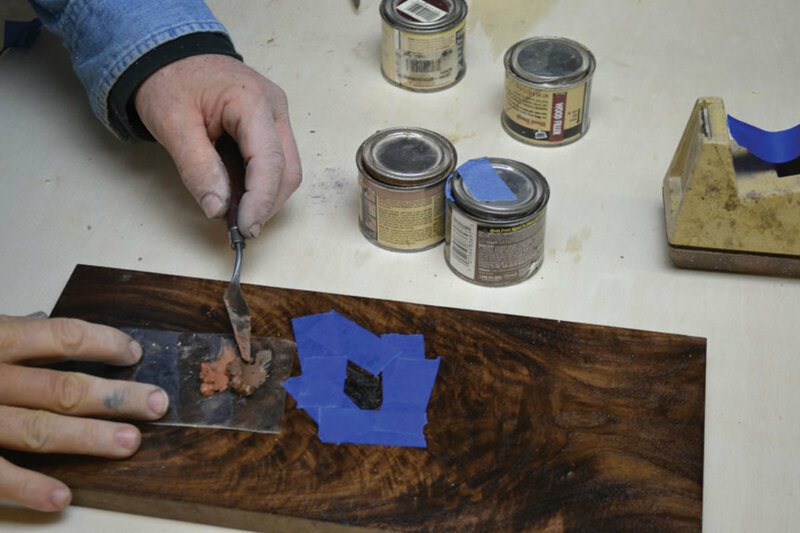 Apply a piece of clear packing tape and squeegee the resin flush with a putty knife. Shine the blue light through the tape. It will set up in about 10 seconds. Remove the tape, sand flush and you’re good to go.